Let’s take a few minutes this week to talk about an exciting event that just took place in our backyard here in Austin, Texas. This past weekend marked the inaugural United States Grand Prix at the Circuit of the Americas. It was held November 16-18th with the final inaugural race taking place on Sunday the 18th. 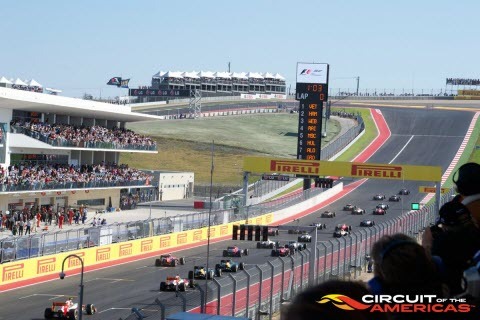 Circuit of the Americas (CoTA) is a new world-class motorsports and entertainment venue in Austin, Texas. Construction began at the beginning of 2011 and the track's nine-layer design is based on decades of racing research and development. A series of layers of material including sandy clay loam, a specific gravel mixture and crushed limestone - all finally covered in asphalt. Approximately 700,000 cubic yards of material was used to precisely construct the 3.4-mile track at this world-class facility. On Sunday, November 18th, this facility was put to the test to withstand vehicles traveling 190 miles an hour in the heat of Texas. Lewis Hamilton racing for McLaren Mercedes took first place in the inaugural event. The construction of this facility and the beginning of a long contracted hosting of the Formula 1 United States Grand Prix through 2012 and V8 Supercars from 2013-2018 has had enormous economic impact for Texas and the Austin business community with projections to continue. Construction of the 375-acre CoTA project created approximately 1,700 construction jobs. Sixteen Texas-based companies were contracted to work on this project totaling an estimated $50 million. Combined with 300 full time jobs that were created, events like this past weekend bring 3,000 jobs for seasonal and event-specific employees. At Falcon Structures, we have seen strong growth as an Austin, Texas, based company over the past year. We were excited to see this project come to fruition this past weekend and are thrilled to be a part of a thriving Austin business community who will reap the rewards of this state of the art facility. Formula One racing is projected to bring $300 million each year for 10 years going forward to the Lonestar state. With visitors coming from every state and across the globe, our Austin based lodging facilities are seeing great opportunity. Transportation is another industry that is experiencing a growth and increased activity. The San Marcos Municipal Airport is almost exclusive to private aircraft is accommodating the sect of the fans visiting CoTa who arrive by private planes and helicopters. An additional 500 shuttles are being used to transport attendees from remote parking lots surrounding the CoTA as well. We are not limiting the industries in our discussion here to only those who are mentioned and are being positively affected by the opening of this state of the art facility. With our own experience in assisting airport projects and the stage, film and special event industry, we are ready to be a part of any storage solution that may be needed at the CoTA. For now, we will be one of the hundreds of thousands of attendees and TV viewers for the upcoming events. Congrats to the entire team at CoTA for this past weekend’s success!